FAQ About Bikes, Pet’s & More! Copyright © 2019 The Greater Ocean City Chamber of Commerce. 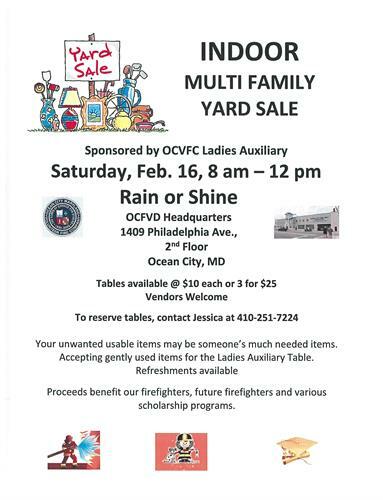 OCVFC Ladies Auxiliary is having another yard sale! Start your spring cleaning early and get a table to sell your items on Sat. Feb 16 from 8a to 12noon or donate your gently used unwanted items to the OCVFC Ladies Auxiliary. Proceeds benefit our firefighters, cadets, The F. Michael Sacca Scholarship and The John Paul Adkins, II Memorial Scholarship plus the Bessie Marshall Benefit Fund. Come check it out you never know what bargain you may find. Vendors welcome. Table rentals are $10 ea or 3 for $25. Call Jessie at 410 251 7224 to reserve tables. Table rental $10 each or 3 for $25. Admission free. You are now being directed to Ocean City Reservation Station (a 3rd party site). For questions or concerns please call 410-213-2400. Enjoy your Ocean City, Maryland Vacation! Email AlertsBe the first to know of deals and events!